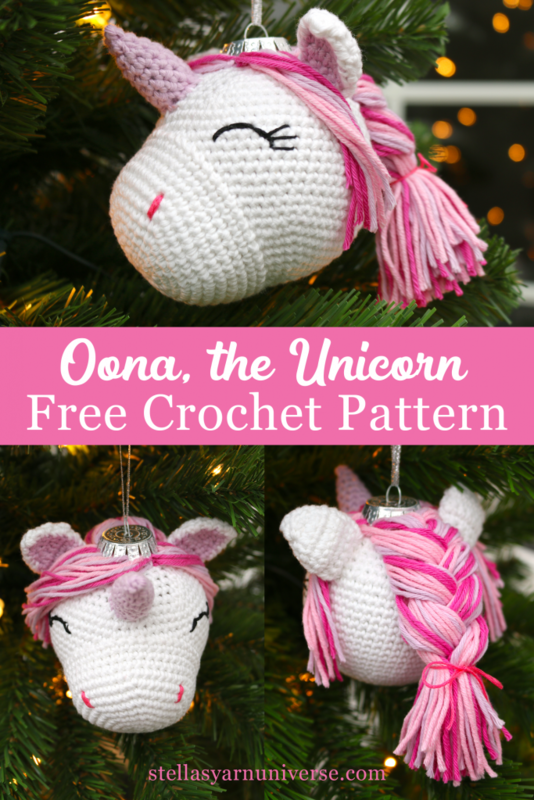 Oona, the Unicorn adds a magical touch to your Christmas tree! But she likes to hang out with you all year round, in your nursery or living room. Her job is to spread joy, wonder, and magic amongst little and big ones alike. I hope you enjoy making her! If you have any questions, please don’t hesitate to email me at stellasyarnuniverse@outlook.com. This pattern is written in US terminology. If you are used to British terms please replace sc (single crochet) with dc (double crochet) and 2sc with 2dc, and you’re good to go. Place your stitch marker in your current loop so you don’t lose any stitches. 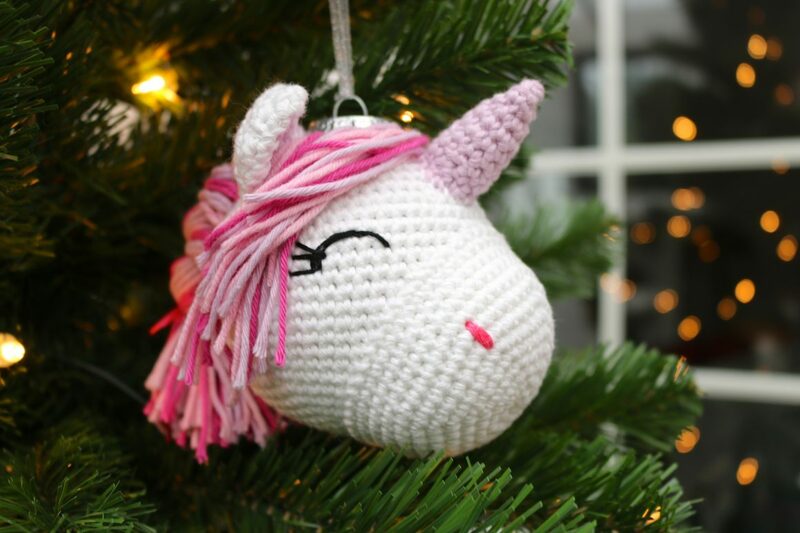 Remove the cap of your Christmas bauble and fit the ornament in the crochet ball, then continue crocheting around the bauble up to its neck. Break the yarn and hide the end inside the bauble. Break the yarn leaving a long (approx. 60cm/24″) tail end to sew on the snout. Pull it through. Take 2 pins and pin through the snout where you would like the nostrils to be. Using the pink embroidery thread embroider the nostrils, making 3 to 4 stitches depending on how bold you want them to be. Tie the ends together on the left side of your work and cut them short. Generously fill the snout with toy stuffing and pin it onto the head, where you would like it to sit. Thread your yarn needle with the long end of the snout and sew all around it until it is securely attached to the head. Sew in the end. Break yarn leaving an approx. 30cm/12″ long tail to attach to attach it to the inner ear later. Place the inner ear on top of the outer ear. Thread your needle with the long end at the tip of the ear and sew through both layers from top to bottom. Now thread the other long end and sew through both layers from the bottom to the top of the ear. 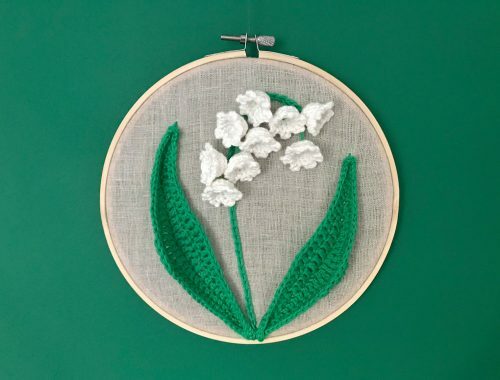 Make one stitch between both layers of the ear so the end sticks out of the ear from the bottom and you can push it between both layers to hide it. Pin the ears onto the head and once you are happy with their placement sew them on, going back and forth a few times until they are securely attached. Tip: You can first loosen the front loops a bit with your yarn needle before making invisible decreases. Break yarn, pull through and stitch through the tip of the horn, so you can hide it inside. Fill the horn with some toy stuffing and pin it onto the forehead. 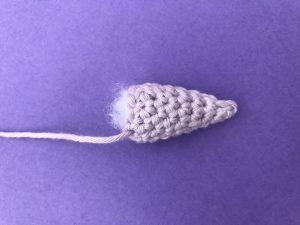 Sew twice around it on using the tail end of the horn. Mark the shape and placement of the eyes with pins. Embroider the eyes with the black embroidery thread. 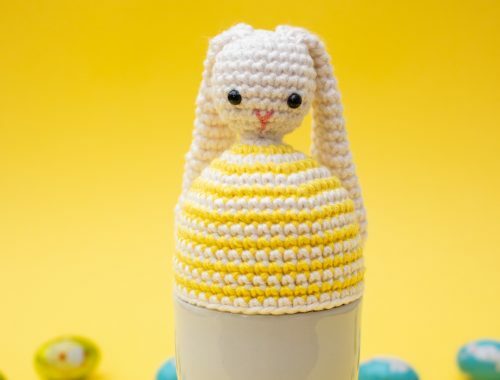 Hide the ends by stitching through the head as far away from the eyes as possible. Cut off the ends that are peaking out. 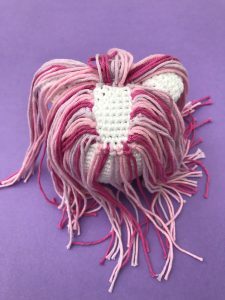 Cut 28 x 30cm/12″ long pieces of yarn each in pink, light pink and lilac. 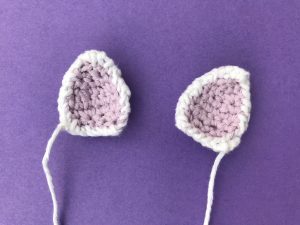 Attach 2 hairs at a time by inserting your crochet hook under a stitch (inserting into one gap, getting out of the next gap). Pick a piece of yarn up at its middle, pull it through so a loop is peaking out of the gap. Pull the two ends you created, that are peaking out of the other gap through the loop and pull the tight. 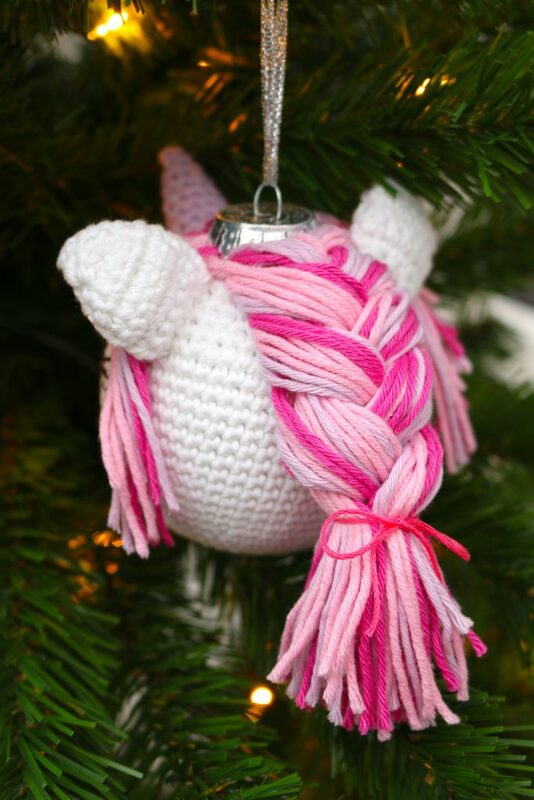 Attach 2 rounds of hair around the neck of the bauble, altering colors (42 pieces of yarn). With the other 42 pieces of yarn create a rectangle outer shape of hair at the back of the head, 2 rows wide. Divide the hair into a front and back part (behind and in front of the ears). Make a French braid with the hair in the back. 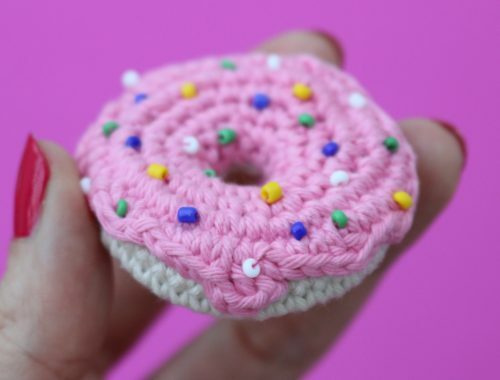 Tie it with a piece of pink embroidery thread. 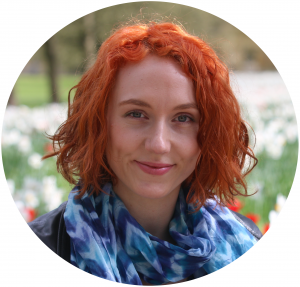 Cut the fringe any way you like! I gave her a cute side fringe. Complete is Oona, the Unicorn! I hope you enjoyed making her! If you have any questions please comment below and I will get back to you as soon as I can. Hi. I was wondering what size of ornament you have used here. I have stitched this 4 times and it does not fit the shatterproof balls that I found. Thanks for your comment. I’m so sorry I forgot to mention the size. I added it now, it’s an 8cm/3.15″ ornament. 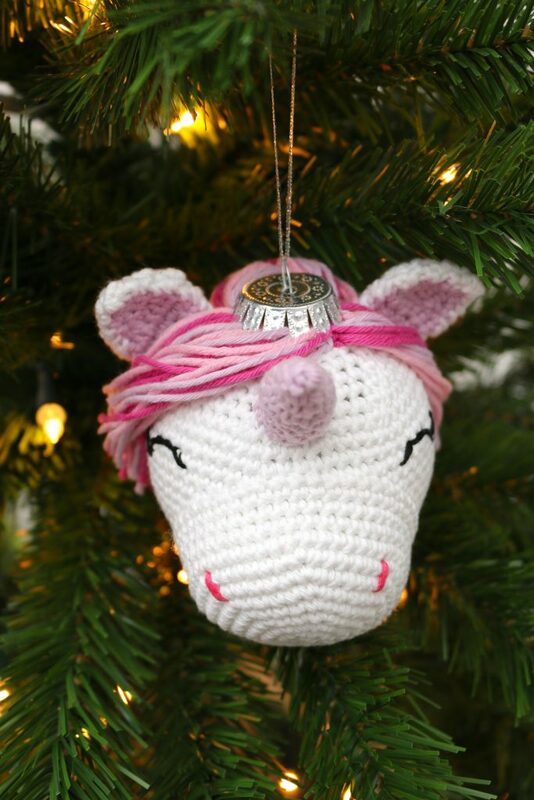 Then you would need to attach more hair to cover the top of the head, and thread a narrow ribbon in between stitches to hang your ornament up. I hope this helps. 🙂 Please let me know anytime if you have any more questions.